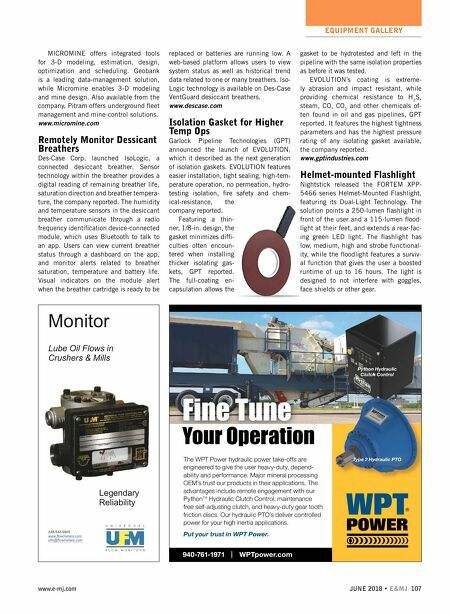 JUNE 2018 • E&MJ 107 www.e-mj.com EQUIPMENT GALLERY The WPT Power hydraulic power take-offs are engineered to give the user heavy-duty, depend- ability and performance. Major mineral processing OEM's trust our products in their applications. The advantages include remote engagement with our Python TM Hydraulic Clutch Control, maintenance free self-adjusting clutch, and heavy-duty gear tooth friction discs. 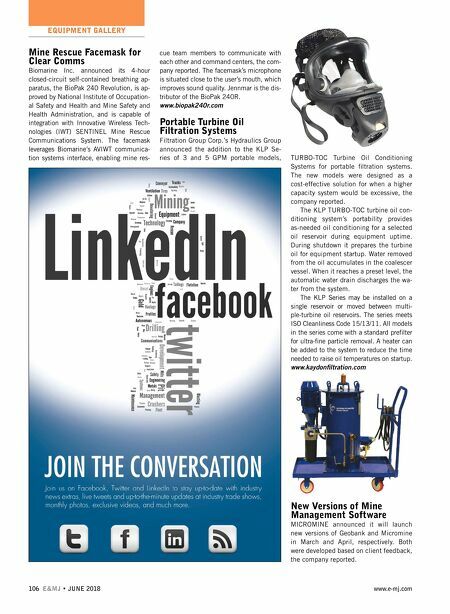 Our hydraulic PTO's deliver controlled power for your high inertia applications. Put your trust in WPT Power. 940-761-1971 I WPTpower.com Fine Tune Python Hydraulic Clutch Control Your Operation Type 2 Hydraulic PTO Monitor Lube Oil Flows in Crushers & Mills 248-542-9635 www.flowmeters.com ufm@flowmeters.com Legendary Reliability MICROMINE offers integrated tools for 3-D modeling, estimation, design, optimization and scheduling. Geobank is a leading data-management solution, while Micromine enables 3-D modeling and mine design. Also available from the company, Pitram offers underground fl eet management and mine-control solutions. www.micromine.com Remotely Monitor Dessicant Breathers Des-Case Corp. launched IsoLogic, a connected desiccant breather. Sensor technology within the breather provides a digital reading of remaining breather life, saturation direction and breather tempera- ture, the company reported. The humidity and temperature sensors in the desiccant breather communicate through a radio frequency identifi cation device-connected module, which uses Bluetooth to talk to an app. Users can view current breather status through a dashboard on the app, and monitor alerts related to breather saturation, temperature and battery life. Visual indicators on the module alert when the breather cartridge is ready to be replaced or batteries are running low. A web-based platform allows users to view system status as well as historical trend data related to one or many breathers. Iso- Logic technology is available on Des-Case VentGuard desiccant breathers. www.descase.com Isolation Gasket for Higher Temp Ops Garlock Pipeline Technologies (GPT) announced the launch of EVOLUTION, which it described as the next generation of isolation gaskets. EVOLUTION features easier installation, tight sealing, high-tem- perature operation, no permeation, hydro- testing isolation, fi re safety and chem- ical-resistance, the company reported. Featuring a thin- ner, 1/8-in. design, the gasket minimizes diffi - culties often encoun- tered when installing thicker isolating gas- kets, GPT reported. The full-coating en- capsulation allows the gasket to be hydrotested and left in the pipeline with the same isolation properties as before it was tested. EVOLUTION's coating is extreme- ly abrasion and impact resistant, while providing chemical resistance to H 2 S, steam, CO, CO 2 and other chemicals of- ten found in oil and gas pipelines, GPT reported. It features the highest tightness parameters and has the highest pressure rating of any isolating gasket available, the company reported. www.gptindustries.com Helmet-mounted Flashlight Nightstick released the FORTEM XPP- 5466 series Helmet-Mounted Flashlight, featuring its Dual-Light Technology. The solution points a 250-lumen fl ashlight in front of the user and a 115-lumen fl ood- light at their feet, and extends a rear-fac- ing green LED light. The fl ashlight has low, medium, high and strobe functional- ity, while the fl oodlight features a surviv- al function that gives the user a boosted runtime of up to 16 hours. The light is designed to not interfere with goggles, face shields or other gear.